There's something inherently awesome about customization, especially when it comes to dessert. I mean, there is just something so sinfully appealing about the idea of choosing as many frozen yogurt flavours, toppings and sauces as I'd like, and arranging them in whatever fashion I feel like. That's one of the reasons I love Menchies. We attended the store opening in The Annex at 511 Bloor St. W. (just west of Brunswick Ave.) and were not disappointed. The chain, which is popular in the U.S. (especially among celebrities) only has a few Canadian stores, but I'm glad to see one downtown. The possibilities seriously are endless - they rotate different types of frozen yogurt (they have over 100 different flavours in rotation, and if I remember correctly, something like 10-12 at a time are available) and you can also mix and match flavours as you please. Each set of two machines also has a lever in the middle so you can swirl those two flavours together if you wish. In fact, when we competed in their blogger competition to make the most inventive froyo concoction, we smushed cheesecakes pieces into the bottom of the cup as a bit of a "crust" - seriously, you could, like, make a moat of sauce. 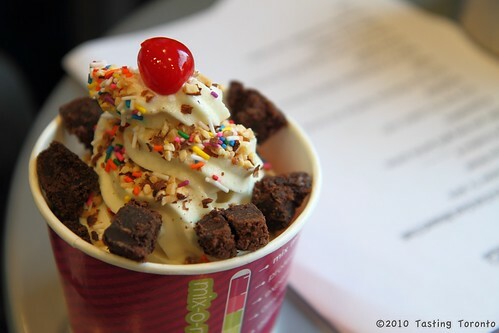 Or swirl froyo only around the outside of the cup to make a trench down the middle and drop all your toppings in along with sauce - A FROYO VOLCANO OF SORTS! Maybe I'm weird but, again, I think that's awesome! You pay by weight, so it's up to you how little or how much you want to have. Try it for yourself - we would love to know what you created! P.S. Mark and I fell in love with the mochi, give it a try - glutinous Japanese rice pounded into little cubes - you can add them to your concoction, they are delicious! I'm going to check it out although i feel like i've gained 2 pounds just from looking at the picture.